Vast Public Indifference: "A Man of his Word"
This Lamson shop stone from 1723 is unusual for its pithy, personal epitaph. During this period, the Lamson shop carved two general types of epitaphs: a short version consisting of name, date, age, and occasionally a one-line verse such as "Ye Memory of Ye Just is Blessed," and a long version that's more personal and usually dedicated to ministers or other eminent public men. 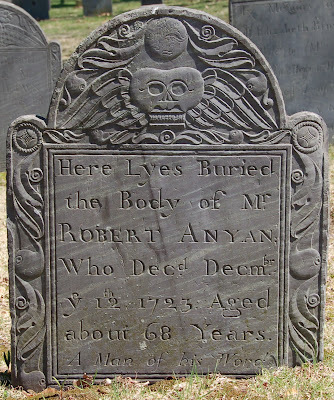 Robert Anyan's stone in Waltham conforms to the short version, but commemorates one of the deceased's admirable qualities, rather than employing a stock phrase. I thought it was interesting that it is "the Body" rather than "ye Body" that lyes there, so I flipped through the illustrations in Forbes. I had thought most of the early Lamson stones were "ye" but it looks like roughly a third of them are "the" and 2/3 are "ye". I wonder if there's a pattern (a particular Lamson family member doing the carving perhaps).